My quilt guild, the Choo Choo Quilters, presented a program on color at our guild meeting this week. 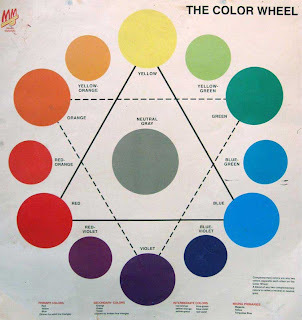 We were only able to scratch the surface of this deep and expansive topic, but a review of the color wheel is always helpful to anyone who creates with fabric, yarn, paper, fibers, surface design or embellishments. It's easy to remember the primaries (yellow, red and blue) and the secondaries (green, orange and violet), but trying to remember split complimentary color schemes and color triads makes me pause to visualize the wheel in my mind. During her presentation, my teammate for this year-long program had us do an exercise by blindly choosing colored paint chips and building color schemes based on the chip colors we drew. It was fun and good refresher on the color wheel. Here are a few great resources geared toward quilters.